The job outlook for film operators from 2016-2026 is projected to grow as much as 13%, which is faster than average, and other film-related jobs are showing similar growth. So, it’s no wonder that you might want to take your passion for film and turn it into a career. Film studies, film theory, production, screenwriting and cinematography are just a few of the areas in which you can decide to concentrate during your pursuit of a film and television degree. Studying film and television in undergraduate or graduate school isn’t all about watching Netflix for “research.” Film degrees can provide you with a variety of problem-solving skills that you can apply to many different areas of work and life and you’ll leave school having developed a highly transferable range of skills. While areas such as screenwriting and cinematography have set rules and structures that have been and continue to be traditionally followed, by learning about film theory and history, you’ll gain a better understanding at how to bend the rules in a way that doesn’t break the mold too much to decrease your chances of success. Did you notice how Hitchcock breaks the 180° rule in Vertigo? 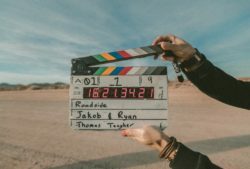 By drawing attention to these moments of disruption in film school, you can get a clearer idea of how you can use traditional filmmaking practices to your advantage. You’ll also begin to view film in a completely different light as you become introduced to various theories, journals and other viewpoints. Sure you’ll probably learn how to shoot and edit, but you’ll also gain valuable skills that will make you more employable in any industry, such as good research and communication, critical thinking, project management skills as well as the ability to organize your time effectively and work towards strict deadlines. The great thing about a film degree is not only the ability to apply these skills to a wide variety of jobs, but that your knowledge is suitable for a wide variety of industries. In the publishing industry, for example, you can write about films as a journalist. There is also work as a content manager or editor, a film archivist, a professor and many more that don’t require you to go into production if you don’t want to. Don’t stress. A film degree is an investment just like making a film is, and the quicker you learn how to budget and move your finances around in order to pay for your film studies, the better off you’ll be in a career in cinema or television. Just as you’ll find in the industry, various financing options exist. Around 60% of the country’s 20 million college students rely on student loans to see them through their degree, so opting for that route is one way to ensure you’re covered for the duration of your studies. Try not to worry too much about interest rates while you’re in school, as most loans won’t begin charging interest until you’ve graduated. And, once you’re out, you can look into refinancing as a way to lower your monthly fees. Regardless of what area of film you’re passionate about, there’s a school and degree just for you. Don’t be scared off by the naysayers who try and discourage you from pursuing an undergraduate or graduate degree in the arts as research shows job growth in various areas of film and television. Work hard at fine-tuning your craft and repaying your loans and you’ll be on the track to super-stardom in no time.